Tungsten (W) is a heavy metal with the potential to impact human health and aquatic ecosystem function. For a long time, W was considered an insoluble metal without serious toxicological or environmental effects. However, over the last decade this view has been challenged and discredited as numerous studies have highlighted the toxicological and environmental effects of W. W has recently been nominated as a priority substance by the U.S. National Toxicology Program in 2002, designated an emerging contaminant in 2008 by the U.S. EPA, and listed as a priority chemical for biomonitoring in 2014 by the state of California. 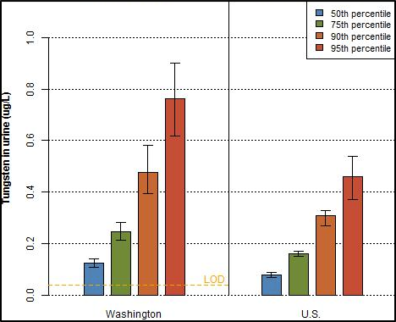 W concentrations in urine of WA State citizens are consistently higher than the national average, and elevated W in urine is linked to higher probabilities of stroke, diabetes, peripheral arterial disease, and altered thyroid function. Despite this information, W levels in WA waters have not been measured, and controls on W solubility, W speciation, and effects of W on ecosystems are not well-understood. 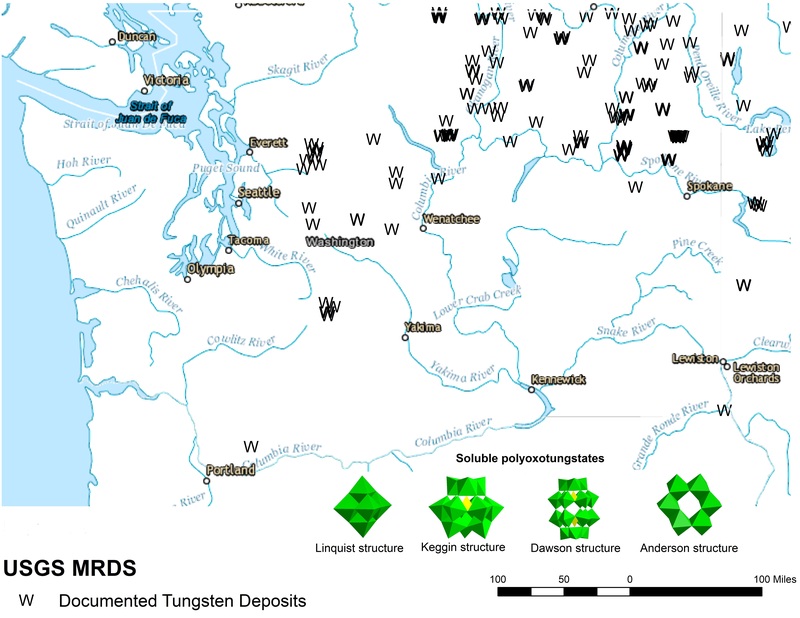 Watersheds of the Pacific Northwest, which are tungsten-rich provide an opportunity to understand how chemical, edaphic, and climatic factors control the solubility and transport of W through watersheds. With the work outlined in this proposal we aim to begin addressing this critical, policy-relevant knowledge gap. Building on recent progress in W analytic chemistry and toxicology, we will test fundamental hypotheses concerning W mobility and speciation in surface waters downstream from W deposits and collect data for an ecotoxicological risk-assessment model. In particular, we will collect and analyze water samples in the areas surrounding tungsten deposits, conduct multivariate statistical analysis in order to biogeochemical factors that control W concentration in samples, and establish a series of laboratory-based dissolution and geochemical experiments to examine and quantify these factors. 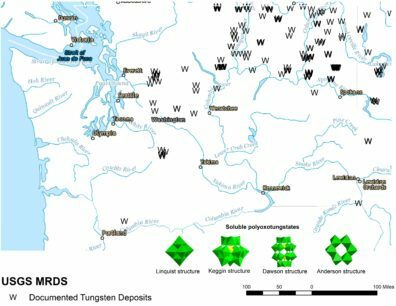 This new (2018) study will be the very first to examine tungsten in environmental systems in the State of Washington. It will provide badly needed insight into rates and controls on W loading to surface waters, thereby advancing fundamental understanding of hydrogeochemistry, providing policy-relevant information to regulatory agencies and policy-makers, and supplying important pilot-scale data.